The US State Department has issued digitally-altered photos showing how Osama Bin Laden may look now, aged 52. 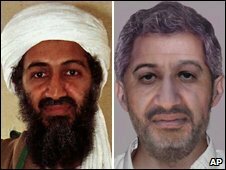 Its 1998 file image of the al-Qaeda leader has been adapted to take account of a decade's worth of ageing, and possible changes to facial hair. The digitally-altered photos on the State Department's website show two options for how he may look now - one with a full beard, and one without. Osama Bin Laden founded al-Qaeda and is top of the US most-wanted list. He is accused of being behind a number of atrocities, including the 1998 bombing of two US embassies in East Africa and the attacks on New York and Washington on 11 September 2001. Since then, his al-Qaeda network has been linked indirectly to bombings on the island of Bali in Indonesia and its capital Jakarta, as well as with suicide attacks in Casablanca, Riyadh and Istanbul. After 9/11, al-Qaeda leaders are believed to have regrouped in Pakistan's tribal areas. Bin Laden is still thought to be hiding in the mountainous region near the border between Pakistan and Afghanistan. In the aftermath of 9/11/2001, the 55,000 member Transportation and Safety Administration was created. A giant bureaucracy. Then we kicked off some wars. US companies making armament, guns, tanks, and planes. Government contractors like Blackwater bilking us for a fortune. Oil companies reaping bumper crops. It is difficult to escape the fact that Osama Bin Laden has been very good for American business. So after ten years, going on a nearly a decade, we still can't find one guy? One 6'5" rich and crazed lunatic being doggedly pursued by literally hundreds of thousands of troops and the finest intelligence gathering apparatus on the planet? How can this be? It is hard to escape the fact that if we find Bin Laden, a lot of the "war effort" might be forced to wind down. People might get tired of paying for and submitting to searches at the airport. Or paying government contractors to bilk us. Whatever way you slice it, Bin Laden's been a boon to a number of financial interests. A lot of us will probably die of old age before Osama does. You can't help but think that is precisely what a lot of people might want. Why kill your golden goose? Why can't we find this guy? Maybe we don't really want to...the boogie man sells guns.